The participating Chapters around the world had the same time (45 days) and funding (2000 USD) available to implement a project on the same global topic. This year’s focus was on “The Internet of Things (IoT) –The future is ours to shape”. Forty three Chapters participated in the challenge. Congratulations to the Benin Chapter, Winner of Chapterthon 2018, and to the other finalists: Afghanistan Chapter and Brazil Chapter! Every year, the Chapterthon brings enthusiasm and excitement amongst our community. During two and half months, 43 Chapters and Special Interest Groups (SIGs) from across the globe worked alongside to bring awareness on the Internet of Things (IoT) to their communities. They ran over 200 training sessions and workshops, engaging students, entrepreneurs, and local governments. They organized national campaigns, their projects were mentioned in local newspapers, and their message was brought to the most remote places. The Chapters also developed IoT applications that may in the future improve the lives of people in their communities, and amongst some of the projects are improved transport systems, agriculture, energy management, home protection, and healthcare. Congratulations to the Benin Chapter, Winner of Chapterthon 2018, and to the finalists! We would also like to thank all of the Chapters that participated in this year’s Chapterthon and helped make it a success! The project proposes an awareness of IoT topics, where school and university students will learn from technologists and IoT experts through information sessions, a bootcamp, and a hacking project in target schools. Students will develop IoT pilot projects using Arduino kits and conduct ethical hacking showing the importance of IoT security. A wrap-up event and an exposure visit will be held in Kabul University. The project aim is to manufacture and field test compact device-collar prototypes, which, attached to the bulls of a breeding herd and linked to a receiving station, will allow remote monitoring of the reproductive activity in arid regions. Objectives include developing a low-cost system, accessible to family producers as well as a simple and high autonomy monitoring system improving the availability and accuracy of sensitive and critical information for the management of the livestock business. The project goal is to develop a lecture course with lab works oriented on the use of the most common IoT hardware and software, namely, Arduino controllers. The measure of the project success will be the well-tested lecture course and 10 trainees ready to take part in real IoT projects. Training will be organized in the Internet availability center for blind and visually impaired people with the objective of giving a good start to a large number of IoT technicians ready to make their inclusion to the development of a digital economy in Armenia. A project creating awareness and motivation on connectivity, networking and communication protocols, and aiming to encourage students from 6 Universities to develop IoT based solutions using Arduino, and other devices. A TV event will reach out to people from the national and international arena and a session at a national event entitled ‘Robotics Olympiad, will be held in Dhaka with 500 students present. The project addresses issues facing the implementation of GPS trackers on public service transport: Implementation costs, data transmission and privacy of vehicle operators. Difficulties relating to participatory sensing i.e. : Capturing location, GPS usage on cell-phones etc. The Co-Pilot Pass mitigates this by not requiring the user to use GPS on their phone or the need for a related device installed on the vehicle, thus removing the fear of users being tracked unknowingly via GPS. The project is a connected object creation workshop with recycled material followed by a public lecture. An awareness campaign and training in the creation of connected objects during 5 days of activities on the University of Abomey Calavi with a free initiation of 20 people (10 women and 10 men) over a period of 4 days. The objective is to educate approximately 150 people in relation to possibilities offered by connected objects and the challenges of security. Based on the Confidence Framework document in terms of security and the privacy of IoT, the project will make a proposal of Good Practices in the deployment of IoT in the country. In order to showcase the Trust Framework application, software will be developed so that the services in the IoT devices can ensure communication between the client and the backend services. Using a test software focused on the downloading of books with free licenses entitled “LIBREria”. The project goal is to develop an IoT device to help small ISP and community networks to deliver a better service to the society, particularly in regions lacking proper infrastructure. The device will help to monitor and predict potential problems in the network due to environmental conditions and electrical network problems. Feedback will be collected monitoring the effectivity of the device, and a publication will be developed in the Created Commons license and available to those interested. A project consisting of organizing, in collaboration with the Association of bloggers of Burkina Faso, a workshop on IoT security and privacy issues, and raising awareness for people using Smartphones and IoT devices. Due to a good structured network of young bloggers and online magazine journalists with many followers, the main goal is to train and encourage them to write blog posts, articles and social media publications in order reach the largest audiences. The project aims to engage at least 12 high level representatives from government, private sector, academia and civil society to join the Advisory Committee for an initial consultation on developing a strategy based on the report resulting from the North American Bureau project: Multi-stakeholder Process: Enhancing IoT Security. This will be followed by the development of an implementation framework for the launch of the IoT Consumer Education campaign. The project aims to raise awareness among Chadian youth through local radio programs, on the safety of connected objects in particular and to inform consumers on the importance of IoT and why security is important. Objectives are to sensitize a large percentage of the population, through community radio broadcasts, and highlighting the importance of the security of connected objects. Disaster.Radio is a project dedicated to enabling communication in real-time disaster scenarios using solar-powered, long-range, low-bandwidth radios. The project aim is to design a mesh routing algorithm suitable for Disaster.Radio and similar hardware. Objectives are a write-up of the proposed algorithm followed by implementation. The final step will be field-testing on Disaster.Radio hardware deployed around Oakland and Berkeley. The awareness project on IoT seeks to make participants conscious of its advantages, disadvantages and uses. This will be done through a program of talks and workshops in schools, and workshops participants will learn to use open hardware and software to develop IoT solutions. Impact objectives following the talks are 600 5th and 6th grade students and 300 6th grade students who will participate in the workshops. The project involves a conference targeting approximately 200 students and entitled the “Internet of Things”, its applications and challenges. Prior to the presentation: a survey evaluating the level of awareness of the general audience, will be followed by a short theatrical show in the local language defining the IoT and focusing on privacy issues. The project will be the creation of localized information material relating the risks of IoT devices and how to prevent them, from an educational and practical point of view. Objectives are to investigate the types of IoT devices with the highest national demand and their potential vulnerabilities. Informative brochures indicating the necessary precautions and a digital alert system reporting potential problems will also be established. During different events, the project aims to raise awareness and sensitize the less favored population in the use and application of ICTs specifically in IoT, as well as creating a model of rapprochement and sensitization to communities. Objectives include publicizing the importance of the IoT with real projects and examples and the creation of a Network in which institutions of all kinds are involved, consequently contributing to the digital literacy of those who need it most. Construction of an IoT system to improve patient care. Hospital patients are periodically checked to see how their vital signs (temperature, blood pressure) are improving. Our solution will allow nurses and doctors more time on other issues and vital sign collections will be done using sensors available to nurses on smartphones transferring the data electronically to the patient record system. The project will introduce IoT technologies to students from leading Georgian universities. Approximately 10 student teams will be invited to participate in Hackathon with the objective of building a working prototype of IoT systems that will include a set of sensors and applications that analyze the data. The aim is to introduce IoT to students and popularize IoT technologies. Prototypes will be developed and the projects will be judged by experts from local IT and business communities. Structuring the place of the IoT in the possible digital transformation of Guinea and its capacity to address challenges. The project will raise awareness and educate consumers in collaboration with the Guinean Consumers Association, challenging stakeholders in the Guinean ICT and Internet ecosystem, to encourage them to play an active role in guiding the market of the IoT through the implementation of capacity building strategies and the application of international standards and best practices. The New Source Institution is a school where Digital is prioritized but where the students know little of the IoT or the security required. The project has organised a 5 day intensive training course on IoT and prepared relevant videos with approximately 30 students to then publish on social networks. A campaign will be held in the local language on information regarding general security of the IoT. The project’s general purpose is to generate basic skills on the IoT, for innovation in devices and emerging technologies in the student population of the Central District, by applying the STEAM methodology. Objectives are to encourage the participation of gender, establish IoT projects and encourage and promote general security on the Internet. The project includes a Seminar entitled “Making a Better Digital Future” that will run an interactive dialogue with a moderator and designated speakers on the platform, but also involving general participants from an audience including IT community, associations, students and business players. Our objective will be a scientific summary that can be used for next quantified program of the Chapter. To take advantage of IoT opportunities, it is important to raise awareness of new cyber-security threats and train people accordingly. A 20 hour training will be organised on IoT Security for 10-15 representatives of Kazakhstan universities and research institutions. Our objective is that students will learn the importance of including security at all phases of designing, implementing, and maintaining IoT systems and after assessment, will each receive a Certificate of Completion. Our project goal is to use IoT technologies to help small scale farmers analyze real time data such as weather, temperature, moisture, prices or GPS signals and provide insight on how to optimize and increase yield, improve farm planning, make smarter decisions about waste distribution and the level of resources needed. Data generated by sensors on the field or during transportation offers a wealth of information about soil, seeds, livestock, crops, costs, farm equipment or the use of water and fertilizer. The objective is to ensure the correct data is available to make the right decisions. Our project is a monitoring platform that will be used to sensitize people in general garbage sorting. Individuals can take a photo or video showing them disposing of garbage in its correct location and posting on-line, whereby a social point will be attributed that will be used to classify model citizens. Later, these points can be used for beneficial purposes, such as the reduction of taxes etc. Sensitization and promotion of IoT and the required security will also be carried out. A project developed involving taking control of household objects by effectively reducing theft (home appliances, air conditioner, vehicles etc.) through a system consisting of a device and a mobile application. The objectives are that in applying an anti-theft system, the control of household appliances, and control of electrical consumption will optimize security and also reduce household expenses. The project organises the implementation of a national online and face-to-face outreach program with media and participatory impact on the IoT that involves promoting knowledge of the current situation of information and communication technologies in Mexico and general IoT information, including practical demonstrations for the adoption of best practices both in industry and at home. A final report with the results of the program will be available. A project conducting a collaboration between professionals working in the ICT industry, ISOC Namibia, local schools and the Ministry of Basic Education. Aims are to introduce consumer awareness and education campaigns on the IoT in general, particularly highlighting the important need for security. A distribution of materials in local languages on highlighted topics, and encouragement for policymakers to take an active role in guiding the IoT marketplace and protecting consumers. This is a project aiming to form an alliance with policymakers at federal and local level encouraging them to take an active role in promoting IoT in their respective government sphere, and focusing on consumer protection and IoT Security. Three advocacy and awareness camps will be organized at federal and local level initiating the use of applied IoT to develop sustainable Smart Cities in Nepal, in collaboration with the IoT expert team. A project taking the initiative to provide training and build capacities with more than 50 teachers from 20 different middle and high schools in Nicaragua. This project will be implement with PUENTES, a local partner and non-profit organization with a network of more than 20 schools to improve quality in education. Over two days, a theoretical session and a technical workshop using scientific references and open source micro-controllers will demonstrate applications in IoT. Objectives include executing a pilot demonstration for educational purposes for future generations. The project aims to increase awareness among students on the concept of the IOT and the importance of privacy whilst using the Internet. Emphasis will be applied on the sensitization of security when using IoT devices and creating passwords for valid users as well as limits on the disclosure of information. Objectives are to improve attentiveness in all of these areas for the future. The project aims to determine the feasibility of the construction of a GPS system operated by a rapid geolocation button for people in any type of emergency, to avoid material and/or physical damage. Objectives are in establishing the basic requirements for the construction of a prototype and evaluation of the simulation performed, by means of established standards. Outcome aims are to evaluate innovative projects that could improve the quality of life of people in general. The project aims to train 20 young bloggers for 10 Days to enable them to start 5 local language blogs focusing on IoT definitions, impact and general know-how. 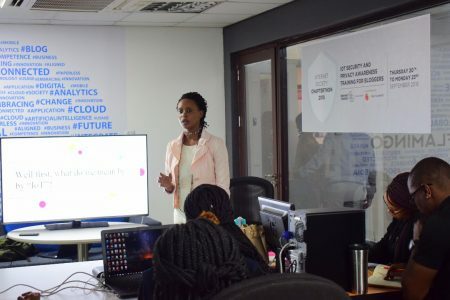 Five groups of 4 members will launch one blog per group: The overall objective is to create awareness on IoT Topics in Rwanda and hopes to reach out to approximately 200,000 people. In Senegal, French, the official language, is only read and written by 15 to 20% of the population and mainly in urban areas. The Tolbi Nagadef project will allow our illiterate farmers to talk orally with their field via their cellphone to receive information (measured by sensors) and advice on climate emergencies etc. Objectives include deploying Tolbi Nagadef for 2 different crops and discuss with stakeholders, levels of security from data collected as well as popularizing the Tolbi project for 2019. The project goals are to clearly inform and educate the ICT and Telecommunication sector and the community in general, of the advantages and risks associated with the current IoT facilitates linking an incredible range of devices and products to each other and the world. Focusing on the most important areas identified including discussions on cybersecurity workforce capabilities, our objective is to ensure guidelines are followed to ensure both awareness and security as much as possible. This project involves the rollout of Arduino and IoT training to 20 grade 8 students at the Curtis Nkondo School of Specialisation in Soweto, Emdeni extension. The objective is a greater capacity for the Chapter to train beneficiaries on IoT in schools and universities. Our aim is to obtain complete Arduino IoT startup kits and consequently develop ideas around how the Arduino boards can interface with the Internet to develop IoT projects, and following the needs identified. Our project aims to promote awareness for Sri Lankans of locally designed and made IoT solutions, and encourage local inventors and researchers. We also plan to develop education materials, conduct a series of stakeholder meetings and launch a national level campaign to introduce national level laws, policies and regulations to consumers. We will identify solutions, followed by a short video and workshop and develop a draft policy document for circulation before final submission to the GOSL. The project aims to provide education, awareness and safety for a target group of children in the Richland Park Community, ranging from ages 6-11. The objective is to help these children be in a safe environment while enjoying and identifying the devices that are connected to the Internet, consequently bringing awareness to approximately 50 children and 10 teachers. Tanzania Consumers Awareness Week on IoT & Security, will focus on creating public awareness on IoT as a new world reality of Internet-enabled devices and the importance of consumers’ privacy protection as well as the IoT ecosystem. Objectives are: An essay competition involving 30 students from 15 different schools from Dar es salaam and an Experts-led Public Discussion on IoT & Security with an expected audience of 150 people. ISOCUBE is a tech hub aimed at spreading technology and building capacities among the community. The project intends to bring technology to the community in the capital, but also in the rural areas. Demo IoT will organize training sessions on the basics of IoT, coding and the core concepts of Internet and Technology. The primary targets are students and teachers. The project objectives lie in promoting the OTA IoT Trust Framework via an afternoon workshop on IoT Security and produced in partnership with IoT Nation. Aims are to build awareness by running an event within the local community, followed by the production of videos from the event, further enlarging awareness to the global community. The project includes the implementation of an educational and informative program aimed at promoting the use of IoT technologies as a solution to the needs of daily life and promoting user development. Awareness campaigns will be held involving approximately 300 youths and students, and awareness will be raised among digital entrepreneurs on the use of personal information and consumer privacy. Highlighting the use of IoT as a facilitator tool for the creation of new business models with 6 different workshops. The project aims to secure decentralized IoT smart home deployments using an immutable data store in the form of a private blockchain. A Hyperledger application will be developed to record data shared by cameras within a connected home using Blockchain technology. Objectives are to bring awareness to the Zimbabwean community on the importance of privacy for IoT devices, and allow young people from the ISOC-funded IoT Makerspace Project to collaborate with Blockchain experts. The future is ours to shape.